Home → Damien Zone → Exhume Natalie Wood? Reopen The Case? What will she look like? If reopening then investigation into the death of Natalie Wood gets a full head of steam, it’s quite possible that her casket might be reopened as well — Her body will have to be exhumed from Pierce Brothers Mortuary Westwood Memorial Cemetery in Los Angeles where she has been buried for exactly thirty years just a few steps from Marylin Monroe. Westwood Cemetery can be found at the corner of Glendon and Wilshire in Los Angeles — so close to the hustle and bustle of West Hollywood hotspots like The Ivy and The Abbey. According to the initial investigation, Natalie Wood fell overboard from a yacht after her husband Robert Wagner and film costar Christopher Walken had gone to sleep in their respective cabins. According to the coroners report, Wood fell overboard and hit her face while trying to get into the boat’s dinghy and landed in the water. There were other indications that she had tried to climb from the water onto the dingy, but the goose down jacket she was wearing absorbed over 4o pounds of water and thereby weighed her down to the point that she could not pull herself up into it. With 40 pounds of water weighing her down, Wood may have floundered in the water for several terrifying minutes before she finally ran out of strength and drowned. Her body was found the next morning floating the Pacific and the dinghy was found lodged in a cove near Catalina Island. 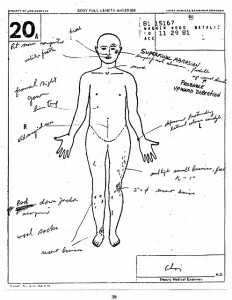 An exhumation of Wood’s body could be a grisly thing. Just about all exhumations are grisly things to watch, but after 30 years in the ground, one wonders how Natalie Wood would look and what good a re-autopsy would do. After her death, Natalie Wood was autopsied and bodies that have been autopsied do not preserve very well. The embalming process takes advantage of the body’s circulatory and lymphatic system to carry the preservative fluids to every nook and cranny of the body — every inch of tissue is saturated and preserved indefinitely. Some embalmed remains last for decades while others succumb to the elements and go through a thorough process of decay. Natalie Wood’s body, being an autopsied body, had to be embalmed differently because a medical examiner cuts out the internal organs of the body and thereby disrupts the natural flow of the circulatory system. A mortician can’t pump embalming fluid into an autopsied body the same way he would with an unautopsied one. The fluids merely spill into the abdominal cavity where all the blood vessels have been severed. the brain soaks up a lot of embalming fluid but an autopsy either removes the brain or at least seperates it from the circulation of the embalming fluid. A brain soaked in embalming fluid is great at preserving the face and head because it gradually releases preservative fluid over the course of years. Natalie’s head is probably empty and thusly it was filled with preservative substances that really don’t do much of anything. Because of this disruption, a mortician has to embalm the body in a more localized way. Arms, legs and other areas of the body are filled with embalming fluid, but this process is essentially useless and only done to preserve the body for a few days. Lee Harvey Oswald, an autopsied body, was exhumed after 5 years and there was virtually nothing left of him. Even his head had become dislodged from his body. It was a pretty disgusting site to behold. Others have been more grisly. Here is a report from someone who knows first hand about how disgusting this exhumation thing can get and gives us an idea of what happens to the autopsied body versus the unautopsied body. “I was working one summer as a caretaker at a large cemetery near my home. Part of my duties were helping to dig graves and often we had to move caskets from the ground in order to make room for another family member who was going into the plot. Sometimes caskets would break apart and the remains would fall out onto the ground because the casket was full of a disgusting smelling fluid. The older guys on the job called that “grave juice.” Other times we would peek into an exhumed casket when the state inspector opened it for a brief moment — they only do that to make sure that somebody is in there and that we actually put them back in the ground. Sometimes the bodies looked like sleeping people. I saw one guy who had been dead for 37 years who looked like he died yesterday, but the casket still stunk when it was opened. Other times I saw bodies that had only been dead for a year and they were disgusting and bloated and their faces were decayed and horrible — like something you would see in a zombie movie. So what will they find if they do have to exhume Natalie Wood? If she was buried in a sealed casket, it will probably be pretty gross. A sealed casket is a terrible thing because it locks out air and the anaerobic bacteria that lived in the body grow like crazy and make the whole thing a giant mess of rotted gangrene. These are, after all, the same bacteria that cause diseases like tetanus and gangrene and botulism. They exist best in a world without oxygen. 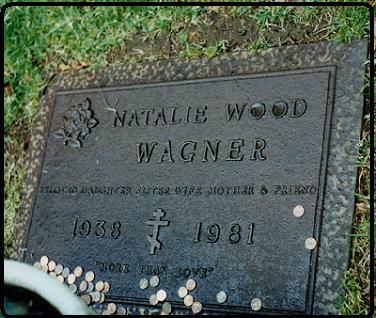 If, however, Natalie Wood’s casket was not a sealed one, or the seal was broken as so many cemetery workers often do intentionally, she is probably a stinky skeleton. I don’t know what any medical examiner will be able to learn from that. The only time re-autopsies have changed the ruling in a case is when new technology was developed to detect drugs or poisons. Natalie Wood drowned and at the time of her death, an autopsy showed that to be the cause of her death was that she had a high alcohol level and she had drowned. Maybe an exhumation will be done simply to scare someone who knows something to come forward. Or it will force any person who may have pushed her overboard to fess up to a lesser charge — none of this seems likely. But what is strange is that Natalie must have screamed for help, but perhaps out on the open water her voice just drifted away like the dinghy she tried so desperately to climb aboard. Facebook Free Heart Transplant Baby photo HOAX! Natalie Wood Death Reopens -- Sheriff sounds like a moron. Be interesting to find out though wouldn’t it! I would be very surprised if they bother as usually it would be at the insistence of a relative or something. It is also more than a bit crazy for this captain to come forward now with revelations after so long a time. So much so that i think they should hold him accountable and charge him with being an accessory but then that would deter others in future cases i suppose. It is highly likely her death was a result of a feud with Robert Wagner but i see no point now in digging up skeletons in the closet. Digging up skeletons being the key words here! Interesting article. The point about autopsy cases being difficult to embalm and those usually not faring as well long term is quite true…however if the embalmer did a thorough job in such a case there is a fair chance an autopsied corpse could remain preserved for 30 years. I recall a couple of cases: Medgar Evers was exhumed in 1991, some 28 years after internment and his body was found to be in essentially perfect condition, looked like he did the day he was placed in the grave in 1963. He was embalmed specially for the long trip from Mississippi to DC. The other is Elizabeth Ratliff who was re-autposied in 2003, some 17 years after her death in 1985. Again, perfectly preserved right down to the make up on her face. But also the body was strongly embalmed in Germany for the long journey back to the US. Both were buried in steel caskets in concrete vaults. But those are exceptional. Most do not fare as well and if the casket is wood….forget it. I would rather remember Natalie Wood for the exceptionally BEAUTIFUL woman that she was, and a very talented actress. I’ve visited her gravesite, and hope that she is now resting in peace, and hope others will do the same. I dont like the embalming process of changing the internals. When i die and when Im dead and gone I want my own blood in my body not any chemicals. In Mexico they did not have the time or budget to embalm, they simply stuffed salt into the nostrils and buried the body the next day. There wasnt a lot of atopsies then or forensic science. I think if embalming has to be done, they could develop a way to seal the body in wax so the fluid cant leek out, and preserve they body. How is Carl Marx’s body preserved so it wax sealed? Is it him or a wax dummy?? The most interesting aspect is that the new highly sensitive technologies make it possible to detect even minute skull fractures. The statute of limitations has passed for crimes such as manslaughter; but any skull damage might provide just enough physical evidence which, when combined with the captain’s verifiable story, could possibly enable the LASD to make a case for murder. Robert Wagner fans would hate to see that happen, but nearly everyone else would very much like to see the outcome–and for the truth to finally emerge. Yes, many people on the internet have stated Wagner wished he cremated her instead of burying her. He always seems suspicious anyway for not being willing to talk to the police (other than initially when it happened). Someone innocent should have no problem talking to the authorities. And there was a woman, Marilyn Wayne, who was nearby and stated she heard Natalie calling for help. Too dark to see anything, but heard a drunk man say “we’re coming to get you.” Of course, nobody helped her. Marilyn noted her fiance called the authorities who said they would send a helicopter, but never followed through and sent one. I believe that Natalie was struck on the skull to render her unconscious and thus easy to throw in the water. The cold water splashing in her face woke her up (she had on a down jacket which kept her afloat) and then she started calling for help. She eventually was numbed by the hypothermia and could no longer call out. The current drug her out to sea and she eventually drowned (according to my search on the net, a person can survive up to 6 hrs in that temperature – 54 degrees). Seems that any bodily process would be slowed by the hypothermia, including digestion of food, which is why I never accepted the official time of death as near midnight.